Clarinet Choir, directed by: Katie Kellert. 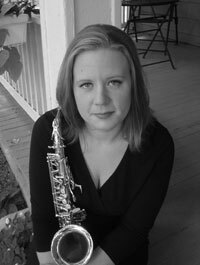 Katherine Kellert is an active freelance musician and private instructor in the Washington, D.C. area. She received her Bachelor of Music in Clarinet Performance from Arizona State University, where she studied with Robert Spring, and has also studied with Steven Cohen, Scott Bridges, and Sandra Garner-Mosteller. Currently she is the Principal Clarinettist with the Mantovani Orchestra and a founding member of Great Noise Ensemble and performs regularly at theaters and with ensembles in the Washington, D.C. area. She appears on the recordings eXchange: China, performing Kawai Shiu’s Winter Tide, and Great Noise Ensemble’s Guerrilla New Music. Ms.Kellert maintains an active music studio of more than forty students throughout the year, many of whom have gone on to pursue successful careers in the arts and other distinguished fields. Her students perform in recitals and concerts throughout the year and have participated in many honors bands, orchestras, performances and competitions including the Fischoff Chamber Music Competition, MTNA Regional and National festivals and competitions, and NPR’s From The Top.